Range that includes all cranes with lifting capacity starting from 37,50 tm up to 137,60 tm. The models with lifting capacity from 37,50 tm to 43,45 tm are available with rack foundation and with bearing foundation; all other models are exclusively fitted with bearing foundation. 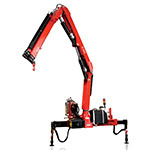 The short secondary boom is available on models up to lifting capacity of 43,45 tm. A complete electronic supply is included in models with lifting capacity from 51,60 tm on up. Range that includes all cranes with lifting capacity from 13,05 tm up to 34,15 tm. All models feature a version with short secondary jib and version with remote control (standard equipment on cranes with lifting capacity of 28.35 tm on up). Version with bearing foundation for continuous rotation models. 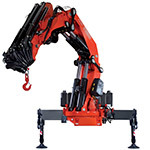 Range that includes all cranes with lifting capacity from 1,10 tm up to 12,25 tm. The short versions are available starting from the model with lifting capacity of 6,65 tm. 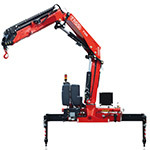 There is also a model equipped with remote control, which is an option for all cranes. All models feature a rack foundation.